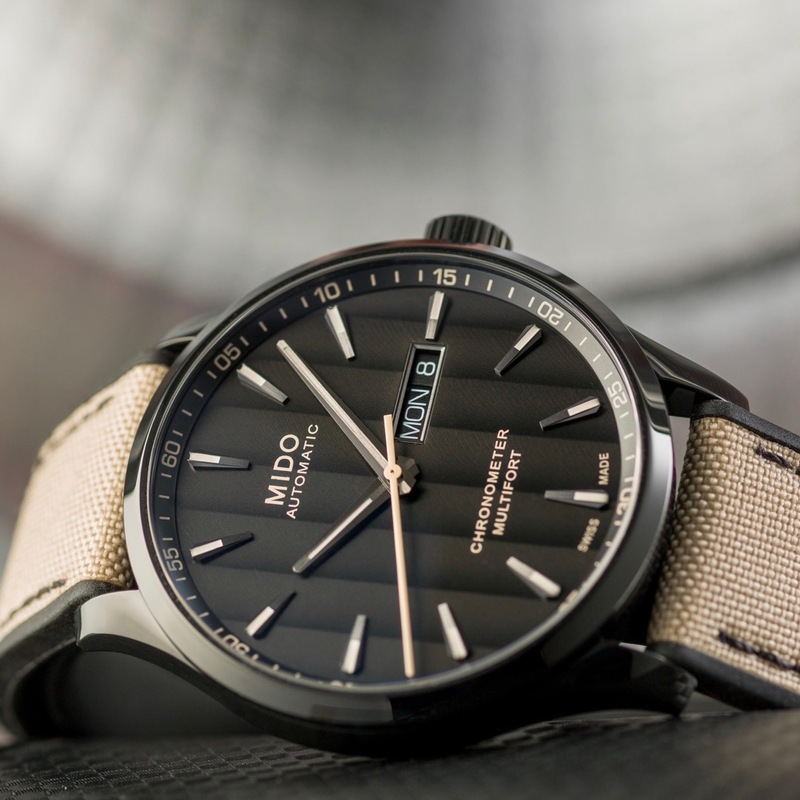 Over the past few years, we’ve brought you word on a variety of Mido watches, and have reviewed some as well (you can see all of our Mido articles here). In fact, we’ve got another Mido review in the works right now. While the Multifort watches often focus on the dials (rightly so), this time around, it’s actually the movement that is the focus of the Mido Multifort Chronometer. Really, it’s sort of a poetic approach to the watch, if you think about it. While the dials on the Mido Multifort watches get attention because of the Geneva stripe finishing – that we more commonly see on movements – on the Mido Multifort Chronometer, it’s really the movement that is the focus. As you can guess from the name of the watch, the movement here is chronometer (aka COSC) grade. This is the first Multifort to be fitted with the Caliber 80 Si movement, which is something that the brand would more commonly put into a higher-end watch. In this way, I think what Mido has done here, really, is create a new entry-level Swiss luxury watch. Which prices starting at $1,250 and topping out at $1,440, this is really something that is, frankly, more affordable than other Swiss watches with COSC-grade movements that feature silicon balance springs. Tuck in an 80-hour power reserve, and you really have a watch that is sort of a sleeper, in the car sense of the term. There’s just a lot hiding behind that lovely dial. Price: $1,440 (dual tone), $1,250 (black strap, silver dial), and $1,380 (tan strap). If I could make one design suggestion, it would be: The day/date window feels too inboard for me. Perhaps moving it to a non-3 o’clock position would allow it to be moved more towards the edge. Automatic Mido Caliber 80 Si (ETA C07.821 base), COSC-certified chronometer, 111⁄2’’’, Ø25.60 mm, height: 5.22 mm, 25 jewels, 21,600 vph, ELINFLEX mainspring, silicon balance-spring, decorative disc with transferred Si logo on the balance bridge. Functions: HMSD+Day. Adjusted on 5 different positions for high accuracy. Up to 80 hours of power reserve. Satin-finished 316L stainless steel, polished bezel with black PVD treatment, Ø42 mm, 3 pieces, domed sapphire crystal with double-sided anti-reflective treatment, screwed case back, transparent case back revealing the finely decorated chronometer movement, water-resistant up to a pressure of 10 bars (100 m / 330 ft). Black rubber with a beige/sand or black fabric insert with stitching in black or beige, stainless steel pin buckle with black PVD treatment. Black, Geneva stripes finish, satin-finished and polished applied indexes with beige/sand Super- LumiNova®, day and date at 3 o’clock. Diamond-cut hour and minute hands, triple faceted, diamond-cut and satin-finished with beige/sand- coloured Super-LumiNova® for easy readability at night.